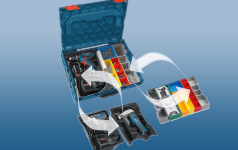 Get your equipment protected and organised with Bosch Mobility System, whether workshop, transport or jobsite. It is the perfect solution for space-saving storage and transport of your tools, accessories and small items. It ensures that when you set off, you are well-organised, travel safely and have everything you need at hand on the jobsite.